You’re listening to the Paleo NP Podcast, episode #15. Did you guys miss me last week? I really wanted to record an episode while I was in Hawaii, but it just didn’t happen. I went to the Big Island first for a medical conference and then for the annual Alaska triathlete pilgrimage for the Lavaman triathlon. About 250 people from Alaska show up there every year for that race and it’s a ton of fun. I ended up not racing this year because of some bike issues, but I swam every morning and did some pretty epic bike rides (before I had the bike issues), which was a ton of fun. I think I rode my bike over 100 miles in four days, which is pretty insane considering I haven’t really been on my bike at all since about June 2017. On race day I did have a blast cheering for all of my friends, which isn’t something I typically get to do since I’m usually participating, so I had a great time even though I didn’t race. So this week I wanted to talk about something that has been on my mind for awhile and that’s food sensitivity testing. Because I think there is some confusion and misinformation out there about how you go about determining if you have food sensitivities and what you should be doing about them. So if you have any sort of chronic health issue whether or not you have gastrointestinal symptoms such as bloating or gas or whatever, you PROBABLY have food intolerances. And I just want to clarify that food intolerances or sensitivities are very different from food allergies. If you have a food allergy, you should never eat that food. Ever. Especially if you have any sort of anaphylactic reaction to that food. But food sensitivities are different, that just means that your body has a reaction to the food which results in a variety of symptoms. So you can react to a substance in a food called histamine, you can lack the enzymes needed to break down the food (such as with lactose intolerance), celiac disease, food additives, or even leaky gut which we’ve talked about a few times before. All food sensitivities, intolerances, and allergies are caused by something that’s called a hypersensitivity reaction. And what happens is that your body recognizes any of the substances that can cause these sensitivities, called antigens, as something that has harmed your body before or as something that has been in your blood stream that doesn’t belong there like in the case of leaky gut, your body sets off an immune response. Now the type of reaction you have (an allergy, intolerance, or sensitivity) depends on the type of cells involved and how long it takes for the reaction to occur. A food allergy is called a type 1 hypersensitivity reaction and it occurs when your immune system identifies a component of the food as dangerous and creates IgE antibodies against it. These antibodies cause large amounts of histamine to be released into the tissue. The symptoms of these reactions are generally quick (less than 1 hour after exposure) and are very obvious and range from mild such as sneezing, an itchy throat, or a rash to more serious like facial swelling or airway constriction and in very serious cases this would be how an anaphylactic reaction occurs. So when you think of food allergies, think of the type of reaction that you might need to carry an epi pen for. A food sensitivity is caused by a type 2, 3, or hypersensitivity reaction and these are different from a type 1 allergy because the mediators (like histamine) are released into the blood instead of into the tissues. This distinction is important because it means that the reaction has less obvious symptoms and is delayed, so up to 8 hours before symptoms appear. These involve IgG and IgM antibodies (instead of IgE like food allergies) Consistent release of these chemical mediators can cause chronic inflammation, pain, digestive upset, skin conditions, and eventually lead to illnesses. Type 2 reactions usually occur with a blood transfusion reaction, which isn’t something that most people deal with, so food sensitivities typically involve type 3 or 4 reactions. A type 3 reaction is what occurs in an autoimmune response and type 4 is what is called a delayed hypersensitivity reaction and can take anywhere from 24 to 72 hours to show up. Food sensitivity reactions do not occur quickly and are less severe than allergies. Because the immune mediators are in the blood, they can lead to symptoms all over the body that appear to have nothing to do with a food you ate, which can also make it difficult to identify the cause. Food intolerances do not involve the immune system at all. They are caused by an inability to digest a food, like I mentioned earlier with lactose intolerance. Food intolerances usually cause some sort of digestive distress like gas or bloating that goes away after several hours. Food intolerance symptoms are typically more obvious than food sensitivity symptoms because they are usually digestive and occur relatively quickly after eating a food. One common disease that doesn’t really fit nicely into any of these categories is celiac disease, so it has some characteristics of a true food allergy because it does involve the immune system - so when someone with celiac eats gluten, your body mounts an immune response that creates symptoms all over the body, BUT unlike other food allergies most people with celiac disease are not at risk for anaphylaxis (and when I say most I mean 99% because I have heard of cases of anaphylaxis related to gluten, but it’s very rare). However, people with celiac disease, like those with food allergies, can’t eat gluten because their body will have an immune response every single time they expose it to gluten. So it kind of exists between food intolerance and food allergy. Testing for true, IgE, allergies is usually done at an allergists office using the skin scratch test or done via a blood test. The skin test is done by apply a food extract or the food itself to the skin in order to create a reaction. You can also test for food allergies using an elimination diet and a controlled food challenge test, the key word being controlled, and this should absolutely be done under the supervision of a healthcare provider because if you really are allergic to a food and you eat it, it can have very serious consequences, so you don’t want to just be doing this willy nilly by yourself at home. This is done a lot with kids and food allergies because a lot of the time they tend to outgrow them, so they use a very controlled food reintroduction schedule after months or years to challenge foods and learn if the allergy still exists. Again, do not do this unless you are doing under the explicit supervision of your healthcare provider. Testing for food sensitivities can be done in two ways. The first, which is actually still the standard of care for food sensitivity testing is an elimination diet with a reintroduction protocol. And the second is a blood test that tests for antibodies to a variety of foods (which foods depends on the test you get). Before I go any further I also want to say that you need to first rule out any food allergies before you do any of this. So if you get an anaphylactic reaction to peanuts, don’t eat peanuts. No one who knows what they are doing is ever going to tell you to eat a food that you have an allergy to. So, I’m not actually a fan of food sensitivity testing for a number of reasons. The first is that it’s expensive and your insurance doesn’t cover it (they run anywhere from $300 to $800). But it also doesn’t measure the delayed reactions which occur in many food sensitivity reactions and even in allergic reactions. I’m going to link in the show notes a position statement from the Allergy Society of South Africa that talks about this a little more if you are interested in checking that out. But the basics are that they looked at the ALCAT test and the IgG test and determined that in kids with asthma, eczema, and irritable bowel, the predictive value of the ALCAT test was extremely poor and of no benefit in identifying the trigger of symptoms AND there was no improvement in any of the patients who followed the diet recommended based on test results. Also there are no peer-reviewed publications or any reasonable studies to support a diagnostic value for any of the non-allergy related conditions for which ALCAT claims to be of value. And not a single non-allergy clinical society worldwide has supported the use of the ALCAT for any of the conditions for which ALCAT claims this test has diagnostic value. And the lack of evidence is similar for IgG testing. I’m not going to bore you with all the other details, you can read the paper yourself if you are interested, but my point here is that a lot of people place a lot of value on these test results and there isn’t a lot to back up the validity of the results. I’m not saying that they are completely useless, but I definitely think that they’re overused. And I totally understand why. I mean, if you could take a simple blood test that told you what foods you shouldn’t be eating or you had to spend months eating a restricted diet and then systematically reintroducing foods, which one would you choose? It’s definitely the easier choice, so I get why people are flocking to that option. But the reality is that the hard option, an elimination-provocation diet, is still the gold standard for diagnosis of food sensitivities. And yes, it definitely has its drawbacks too. A typical elimination diet is followed for at least 30 days, and there are so many different variations of these, but at the very least you would be eliminating processed foods, gluten, dairy, grains, soy, certain oils, and most food additives and preservatives. If you have an autoimmune disease (or suspect that you do) there’s a whole other list of foods you’d want to eliminate including nightshades, coffee, eggs, and a few others. And then once you’ve seen a certain level of healing, you would systematically reintroduce certain food groups to see if you have a reaction. Some of the criticisms of this form of testing food sensitivities is that it’s highly subjective and it’s possible to both miss symptoms or misinterpret a symptom that isn’t really there. I have also heard people in the health world talk about how these diets eliminate nutrient-dense foods that may not need to be eliminated if you aren’t actually sensitive to them as well as the opposite being true where you are only eliminating common trigger foods and you may actually be sensitive to something that you didn’t eliminate which can cause your symptoms to continue. While I don’t deny that this is true, in my opinion, these are not good reasons to rely on a relatively inaccurate test instead. I also think that because of some of the trouble shooting that may be involved in an elimination diet, it’s important to work with a practitioner because if you are following an elimination diet and you aren’t seeing results, then there definitely may be some benefit to doing food sensitivity testing or looking for other root causes of your symptoms. I also won’t deny that an elimination diet is hard to follow. But the benefit that you get from following it the best you can is two-fold. So, not only do you come out of it with a diet that is 100% personalized to you, but you also heal your body and potentially reverse autoimmunity to a certain point. There’s no blood test out there that can heal your body for you. Unfortunately that’s something that you have to put effort into. As far as determining what constitutes a reaction, that can be a challenge for a lot of people, which is why I think that keeping a food and symptom journal is so valuable. And I know that if you are feeling really terrible and you are doing your elimination diet and you get to the point where you are reintroducing a food that you really want to eat, it can be very easy to overanalyze everything that is happening in your body that may or may not constitute a reaction to that food. And I completely sympathize with that, but I also think that there is a fine line to walk between being obsessive about it and being kind of a casual observer of what is going on with your body. And unfortunately that can be a difficult skill to learn and it’s certainly not something that can be taught. I’m going to use myself as an example on a few points here, but I first want to say that I have been very lucky to only have suffered from debilitating symptoms (mainly fatigue) for a relatively short time. And I want to acknowledge that there are people who truly don’t feel like they have time to mess around with tweaking their diets to figure out what makes them feel better and what makes them feel worse, and that would be a case where I might say that starting with a some food sensitivity testing would be a good thing, because while it isn’t accurate, it can provide a starting place that might get you some quick wins in the symptom department. That being said, I strongly encourage everyone (even people who feel awful and need to hurry up and feel better) to put in the time and effort to figure this out without testing because I think if you take a less obsessive and more casual approach to this, you actually learn more and are better in tune with what actually constitutes a symptom and what doesn’t. For me personally, I went Paleo in 2009 simply with the intention of being healthier. I wasn’t aware of any symptoms that I wanted to improve or anything like that. So when I did that, and I think I’ve talked about this before, I discovered that certain foods did actually make me feel bad when I ate them, so things like soy, gluten, and some grains. Then the longer I was Paleo I discovered that there was actually an amount of these foods that I could eat with no obvious consequences, but once I went over the threshold, I had symptoms like fatigue, gastrointestinal distress, or breakouts. Or when I decided to test a food, and I was never super systematic about this, I’d eat something, like dairy, a couple of times over the course of a few days and just see how I felt and if I didn’t like the way I felt or if I suddenly got a bunch of zits, I attributed it to the dairy. Now, this all sounds really laid back and casual, which it kind of is, but that’s the thing, by completing this process over and over again I have a pretty good idea of exactly how a food is going to affect me and what I can and can’t eat. Now, I’m pretty lucky in that I don’t have a lot of food sensitivities, but I’m not sure that I would have changed much about this process even if I did other than not eating the things that make me feel bad. I’m worried that I’m making this sound oversimplified, which is not my intention, and I know this still sounds impossible for some of you, but my point here is more that if you don’t want to be obsessive about it, then don’t. You can still get the information you need without being obsessed about how you feel or if something is a symptom. 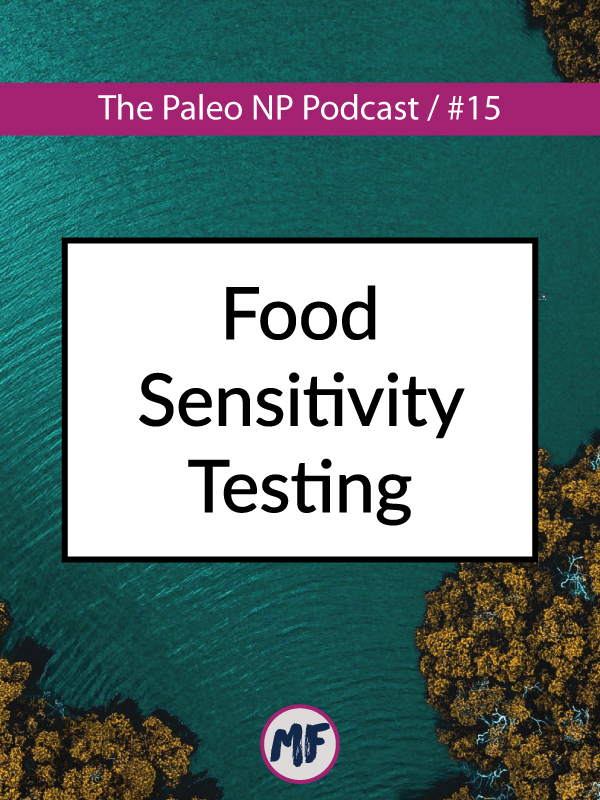 Also, with the blood test for food sensitivities, if you do end up going that route and something shows up on your test that you hardly ever eat, that likely means that you are very sensitive to it and should probably avoid it. The other thing that can be helpful with these tests is that if you have a ton of foods show up, that doesn’t necessarily mean that you are and always will be sensitive to those foods, but what it does show is that you probably have a fairly serious case of leaky gut happening. So just because you have 50 foods show up on your test (which is a lot), that doesn’t mean that you are and always will be sensitive to those, it means that your immune system is on overdrive and you’ve got a serious case of leaky gut. One of the other problems with these tests is that your blood cells have a life cycle of about 100 days, so what shows up on your test today could be different in three or four months. But since these tests are expensive, it’s not likely that you are going to want to retest very frequently to see how things are changing (or use it as a gauge for your gut healing). So to sum all that up, my basic recommendation is that you should use an elimination diet to determine your food sensitivities and then consider using a food sensitivity test as a last resort if you are having lingering symptoms or know that you are sensitive to something but you can’t seem to figure out what it is with your elimination diet. So how do you get rid of food sensitivities? Well, first of all, if you have a true allergy, you’ll probably never get rid of that, so that’s not what we are talking about here, but with food sensitivities, so any food that causes you to have any symptoms or something that showed up on your food sensitivity testing if you went that route, you have to heal your gut. And depending on how severe your leaky gut is, it can take 3-6 months or even a year or more to do that. And I know that no one wants to hear that it’s going to be a year before they can eat chocolate again, but for some people, that’s just how it is and it stinks, but it’s reality. And leaky gut can be complicated by things like IBD or celiac disease which can make all this worse and take longer for you to heal. The biggest thing you can do to heal your gut is to avoid inflammatory foods, which include all the foods you are sensitive to but more generally if you don’t know what those are yet, all of the things you eliminate during your elimination diet are common inflammatory foods. You need to decrease stress or work on stress management in areas where you can’t completely eliminate stress (because we all have some level of stress in our lives, but how we respond to it makes a huge difference). Be sure that you aren’t using toxic personal care or cleaning products, and I have several recommendations for what to use instead if you check out the show notes for episodes 5, 9, and 10. Make sure you are getting plenty of sleep (7-9 hours a night), and make sure that you are eating a nutrient-dense, healing diet. After you have done some healing, you can test the foods you are sensitive to. If you are following an elimination diet, this will be built into the reintroduction protocol, but if you just had food sensitivity testing done, you’ll want to test those foods in a systematic way and only one at a time over the course of several days to gauge any reaction you might have. And again, the amount of time you need to not eat these foods varies, but at a very minimum I would say 30 days, but for a lot of people it’s more like 3-6 months. And if you do reintroduce a food and you don’t appear to have any reaction to it, I would still use caution and eat that food only in moderation, because this can unfortunately be a moving target. So as I said earlier I know what my tolerance to certain foods is. I know that putting heavy cream or half and half in my coffee for a couple of days is fine, but if I do it for several weeks, I’m going to have some skin issues and start to feel kind of lousy. The same actually goes for gluten. I can eat a little bit of gluten occasionally with very few ill effects, but this is the result of me not eating it and then eating a lot of it, and then not eating it and then eating a little bit and kind of just seeing how that all played out. And this is why I love the elimination diet approach, because I just think it teaches you so much about how you react to food. And if you’ve never done something like this before and you’re thinking it all sounds crazy, I would encourage you to try something like a Whole30 and just see what happens, because it’s really hard to quantify some of this to someone who has never done it before. Even if you aren’t dealing with any serious symptoms, it’s a good exercise to try as far as learning to listen to your body, because that’s a skill that just needs to be practiced. When you do your reintroduction protocol and you find that you think you reacted to something, I highly suggest testing the individual food by itself at some point down the road. So I think the Whole30 reintroduction does more groups of foods rather than individual foods, so if you have some sort of reaction on the day you reintroduce dairy but you ate three different kinds of dairy, I would suggest going back to Whole30 eating for at least 3 days and then testing specific dairy items one at a time. So first try butter, and eat a little bit of it at every meal (or three times a day) and see what happens. This can also help you determine your tolerance threshold as well, so maybe you don’t react until after the third serving you might have more tolerance but still be sensitive. And I actually talk a little bit about which foods in certain categories (especially dairy) are better tolerated in my book, The 30 Day Energy Reset, and give you a reintroduction protocol based on what is best tolerated by most people. So you might be able to eat butter and goat cheese but not drink milk, but you’ve, unfortunately, got to test those foods individually. Also I want to touch on one last thing about an elimination diet that came up in a conversation with a client. One of the criticisms I’ve heard with doing an elimination diet and then reintroducing potentially problematic foods, especially in people with autoimmune disease is that people are often afraid that reintroducing a food they are sensitive to will provoke a flare up or cause the healing they’ve done to be undone. I’m going to address these two things separately, so if you are introducing one food or food group at at time and following a protocol, it is very unlikely that you will undo any of the healing you’ve done. The problem comes when you try and rush the process and do too much too fast. Then you can cause your leaky gut to come back and you aren’t exactly back where you started, but you end up having more work to do. This can be avoided by being very systematic about the way you reintroduce things and not doing overboard and eating all the things over the course of a few days. Patience is key here. As far as autoimmune flare ups during reintroduction go, they can happen, but because of the controlled way that you are reintroducing foods a little at a time, most people don’t generally get a full blown flare up, they tend to have symptoms that under other circumstances would develop into a flare up, but they don’t typically happen because you are only introducing a small amount of a specific food at any given time and then you go back to eating the things that you know are safe before reintroducing more foods. Alright, that’s all I’ve got for you this week. I hope you enjoyed this week’s episode. And if you did enjoy it I would love it if you would head over to iTunes and leave a rating or a review so that other people can find this show, or share this episode with someone who you think might find this information useful. Thanks so much for listening and see you next week!